In America, there are many employees that are very passionate about their work and work a significant amount of hours to achieve company goals. Still, there are instances when workers are not always fairly compensated for their time and effort given to a company. The Fair Labor Standards Act was created to prevent employees from being overworked and underpaid, and the U.S. Department of Labor regulates this. 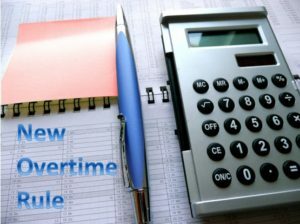 Moving forward this year, they recently announced an exciting new rule that will affect several hard-working employees across America. They established a mechanism for automatically updating the salary and compensation levels going forward to ensure that they will continue to provide a useful and effective test for exemption. These changes may seem shocking to employers who have will have to adjust their current wages for some employees and may have to alter the titles of others. Because this new rule only affects exempt employees, it may be in the best interest of a company to reevaluate their current job titles and decide who meets the criteria for exempt status. If they fail to meet this criterion, then they may need to be reclassified as non-exempt, and thus need to abide by the rules for this. Because the effective date is looming, it is important to begin preparing for this change ahead of time. Visit www.dol.gov to learn more about the new law, and brush up on the regulations that surround each type of employee. It is very important to remain compliant to avoid future audits that could lead to large penalties and fines when rules are not followed. It has been over 10 years since the minimum salary threshold has been examined, and this is an important step forward for exempt workers. The Department of Labor feels like this will be an effective measure to ensure that all policies and laws are up to date. The fascinating impact of this rule reveals how the Department of Labor is actively examining our current laws and practices to ensure that employers are being fair and consistent with each employee. Employers must keep this rule, as well as all others, in mind when considering their future plans with their company and its employment. When employees are properly compensated, they are usually more productive and motivated to give their best effort in the workplace. With the proper laws in place, this will become a more common occurrence, and employees can continue to work knowing that their wage is fair and their work is valued.